Are you a “Want-to-Be” Seller? 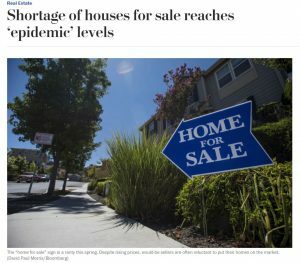 March 27, 2018 – Anthony Lamacchia, owner of Lamacchia Realty, was featured in a Washington Post article today, “Shortage of houses for sale reaches ‘epidemic’ levels.” The article discusses how “frustrated wannabe sellers” want to sell but are stalling because the lack of homes on the market for them to purchase is at an all-time low. Without a home to buy, where do sellers go once their house sells? Anthony provides options to sellers and buyers which might lessen the inventory gridlock. Click here to read.